Mumps Hall in December 2007. Click for a larger image. Number 4, Hall Terrace, Gilsland is a building of obvious antiquity. 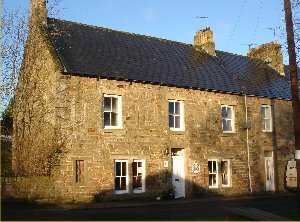 Dating back to the 17th century, it is one of the oldest and most interesting buildings in present-day Gilsland, the original small, stone-framed windows, now blocked, being the clearest hint of its age. This house is now, in 2016, divided into House of Meg tea-rooms below and a flat above and is known locally as Mumps Hall, although spellings, and in particular, punctuation of the name have varied widely. It is popularly associated with Scott’s characters from his novel Guy Mannering such as Meg Merrilies, Dandy Dinmont and Tib Mumps, and with various tales of how the treacherous occupants would rob and murder unaccompanied travellers. There is also a legend of a tunnel linking Mumps Hall with the site of Merrilies Cottage. Just across the road are two other venerable houses with their own claims to association with the Wizard of the North, if only by name. These are Dinmont House (Late C17, Grade II listed) and Merrilies Cottage (1877), both recalling characters from Guy Mannering. Why the latter, in particular, should be so-named, and why today’s Mumps Hall should be so difficult to reconcile with descriptions from Scott and other nineteenth century writers are problems which need to be addressed. Scott attributes the curious name to a Lallans dialect word meaning a beggar, interpreting the name as "Beggars’ Hotel", although the Online Scots Dictionary suggests "cheat" or "grumbler". It also seems possible that it could be derived from Monks’ Hall or Hill as there is a common near Kiln Hill farm labelled Monk Hill on William Howard’s 1603 map of the barony; Ceilia Fynes, in her diary of her journey through present-day Gilsland in 1689 calls the building "Muneks Hall" but her spelling is rather idiosyncratic - and inconsistent - she also calls it Mucks Hall in the same paragraph. Jokey or derogatory place or house names were commoner than you might think before the Victorians tidied them up. One thing worth bearing in mind when reading old documents is that the hamlet on Cumbrian side of what is now Gilsland was known as Mumps Hall, or Mumpshall. The bridge over the Irthing in Gilsland is still known as Mumpshall Bridge, and in 1927 the title page of the marriage register for Gilsland Methodist Church gives the address of the chapel as "Mumps Hall, Upper Denton". Despite the fact that 4 Hall Terrace is known as Mumps Hall, Scott in fact described an old alehouse originally on the site of Merrilies Cottage as the meeting place of Meg Merrilies, Dandy Dinmont, Tib Mumps and Brown in Guy Mannering (read). He confirmed the identity of the building as Mumps Hall in a footnote to the Magnum Opus edition of the Waverley Novels (read) and his description was enthusiastically confirmed by George Mounsey in his book Gillesland (read). Dr Granville, visiting Gilsland in 1839, was shown "the miserable thatched hut, its walls now plastered up and tinged with yellow ochre, which Scott has rendered so famous" which doesn't sound like 4 Hall Terrace.